Looking for a bus in Elmhurst? Chicago Charter Bus Company has access to hundreds of buses to take you to the Elmhurst Art Museum, Pints Elmhurst, and more. When you live in a city bordering Chicago, it’s common for people to overlook the charms and quirks of your actual place of residence. Elmhurst is one of those suburbs that boasts its own destination-worthy draws: the Elmhurst Craft Beer Fest is just one example. Speaking of which, if you have events on your calendar similar to the craft beer festival, have you considered renting a minibus to safely transport you and your friends to the action without assigning a sober driver? The minibuses and charter buses in our network have multiple uses, and you can personalize your bus of choice to match the occasion. Small groups such as wedding parties, bachelorette parties, and sports fans following the team to the championship will do well in the 18-passenger, 20-passenger, or 25-passenger minibuses, depending on the exact amount of people joining the ride. Using these efficient vehicles allows your party to get to your destination as a unit so nobody gets left behind while dodging traffic. No matter if you’re cruising around Elmhurst or planning on heading into Chicago, there’s no trip too short or too long for Chicago Charter Bus Company. The large, 56-passenger luxury bus option is often rented out by Elmhurst schools and sports teams—the coach has storage galore, so backpacks, gym bags, and sports equipment can all fit comfortably alongside the passengers. Think you might need fewer seats for your trip? Check out a few smaller bus options. Comfort doesn’t end with roominess, though. You can enhance the minibuses and charter buses with a number of comfort, entertainment, and style features. Depending on the occasion, you may want to add TV monitors for kids on long-distance field trips, free onboard WiFi for corporate travelers glued to email inboxes, or reclining seats for sports teams needing to snooze after a hard-fought game. Your travel options don't stop with these amenities. With service in Chicago neighborhoods such as Northbrook, Rosemont, Winnetka, Evanston, Naperville, and more, we make it easy to craft your own Chicago-area travel itinerary. Check out our pricing guide to get an idea of what you’ll pay for your bus rental in Elmhurst. 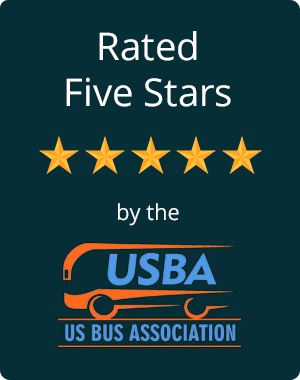 However, if you want a more accurate quote based on add-on features and your trip details, we recommend calling us at 312-667-0906​. A few minutes is all it takes to get an affordable minibus or bus rental quote—then, you can book immediately or choose to think on it. Either way, we’re available 24/7 to help out.